Our #1 selling residential panel is formed from 29 Gauge High-Tensile Strength Steel. It is ideal for most residential & agricultural applications. The MAC-RIB Panel covers 36″ and has a rib height of 3/4″. It is available in Lifetime Warranty and 10-Year Warranty Panels. 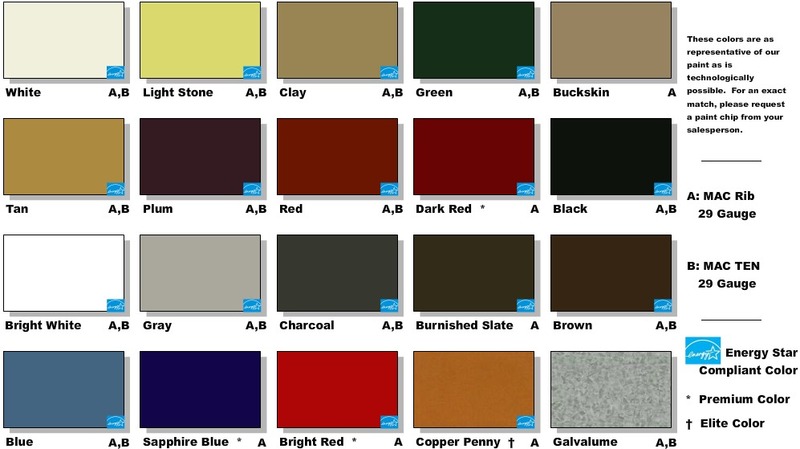 We offer a palette of 19 colors and bare Galvalume to match almost any building. An extensive line of color-matching trim makes this product line ideal for any project. Call us today, or fill out our Quote Request Form. We want to help you with your next building project. We offer a wide variety of trim. For more information about the trim that we offer, please visit the trim page on our distributors website. …and much more. Please visit the trim page on our distributors website for our complete trim offerings. We have everything you need to get the job done! Give your next project a professional finished look by using the right accessories and tools. Please visit the accessories page on our distributors website for more information. …and much more. Please visit the accessories page on our distributors website for our complete accessory offerings.